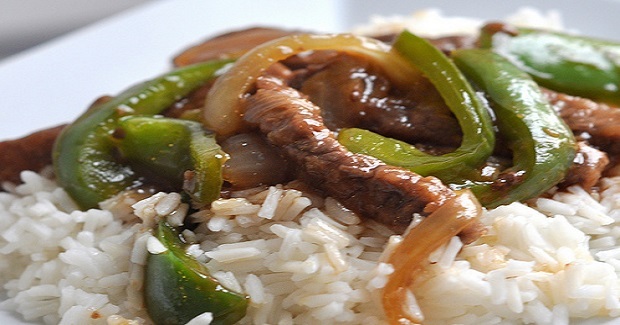 Pepper Steak Recipe - Gutom Na! Posted on Thursday, August 4th, 2016 at 7:10 pm. Lightly coat steak with cornstarch. Shake off any excess. Saute in medium high pan with about 3 Tbsp of vegetable oil, till brown. Remove from pan and place aside. Using the same pan, add about 3 Tbs of vegetable oil and saute the green pepper and onion. Add salt and pepper to taste. Saute to desired doneness. Return meat to the pan and turn heat to high. Add soy sauce and 1/2 or 1 can of beef consomme. Turn heat down and taste. You may have to adjust the salt content due to the soy sauce and consomme. Add salt and pepper to taste. Make a corn starch slurry in a separate dish, by adding about 2 Tbsp of cornstarch with 3/4 cup of very cold water. It should be a thick, but liquid, consistency. Add the slurry to the pan to thicken the sauce. Add slowly, as you don’t want it too thick!